Join Us!!! We are looking for someone to help us cover Guinea-Bissau basketball. Please send us an e-mail. Defending champion Crvena Zvezda MTS Beograd (KLS) landed 31-year old American (has also Bissau-Guinean passport) shooting guard K.C. Rivers (196-98kg-87, college: Clemson). He started the season at Grissin Bon Reggio Emilia in Italian Serie A. In 9 games he averaged 14.0ppg, 4.7rpg and 2.7apg this season. The last season Rivers played at Panathinaikos (A1) in Greek league where in 32 games he had 7.3ppg and 1.9rpg. He helped them to win the league title. It was a very successful season in his career as he was selected to Eurobasket.com All-Greek A1 2nd Team and to the All-Star Game. Rivers also played 31 games in Euroleague where he recorded 8.5ppg, 2.7rpg and 1.1spg. He contributed to his team making it to the quarterfinals. Rivers is a very experienced player. He has played also professionally in France (Chorale de Roanne), Germany (Bayern Muenchen), Russia (Lokomotiv), Spain (Real Madrid) and NBA G League (Stockton Kings). Rivers attended Clemson University until 2009 and it is his tenth season in pro basketball. 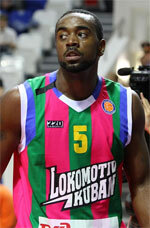 Grissin Bon Reggio Emilia (Serie A) tabbed 31-year old American (has also Bissau-Guinean passport) shooting guard K.C. Rivers (196-98kg-87, college: Clemson). He has played for the last two years at Panathinaikos in Greek A1 league. In 32 games he averaged 7.3ppg and 1.9rpg last season. Rivers helped them to win the league title. He can count that season as a very successful as was selected to Eurobasket.com All-Greek A1 2nd Team and to the All-Star Game. Rivers also played 31 games in Euroleague where he had 8.5ppg, 2.7rpg and 1.1spg. He contributed to his team making it to the quarterfinals. Rivers is a very experienced player. He has played also professionally in France (Chorale de Roanne), Germany (Bayern Muenchen), Russia (Lokomotiv), Spain (Real Madrid), Italy (Benetton Treviso) and NBA G League (Stockton Kings). Rivers attended Clemson University until 2009 and it will be his tenth season in pro basketball. Let's have closer look into His outlook: One of the top all-around players on the team, he possesses a strong basketball IQ. Has shown to be a solid rebounder. Can score in lots of ways, hes also a good defender on both guards and forwards. Shahrdary Gorgan (Superleague) landed 30-year old American (has also Bissau-Guinean passport) point guard Perry Petty (185-86kg-88, college: UTRGV).The last season Petty played at Dzukija (LKL) in league where in 15 games he averaged 10.2ppg, 6.3rpg, 4.2apg and 1.9spg. Good season as he was selected League Player of the Week. Among other achievements his team won Hungarian Cup in 2016. Petty received also USBasket.com All-PBL Player of the Year award back in 2012. He is a very experienced player. And here thanks to pro basketball Petty experienced life in nine different countries playing on four different continents. He is familiar with European, Asian, Latin American and of course North American leagues. Petty has played previously professionally in Belarus (Tsmoki-Minsk), Greece (Apollon Patras and Ifestos), Italy, Lebanon (Al Moutahed), Romania (Giurgiu), Slovakia (Vahostav-Zilina), Venezuela (Trotamundos), Hungary (Kormend and Szolnok) and IBA-PBL (Cent.Illinois D.). He attended previously one of camps at Eurobasket Summer League on he way to pro basketball. Petty attended University of Texas Rio Grande Valley until 2011 and it is his eighth season in pro basketball. Let's have closer look into His outlook: Perry is a Point Guard that can control the tempo of a game and creates problems with his shooting ability on the offensive end of the floor. He is a very aggressive defender and is able to guard positions from the 1 or 2. Great rebounder for his position and is able to be very effective in the pick and roll set.